Jewelry is the international language of appreciation and love. It is a token of gratitude, friendship, and affection to those who enrich our lives. 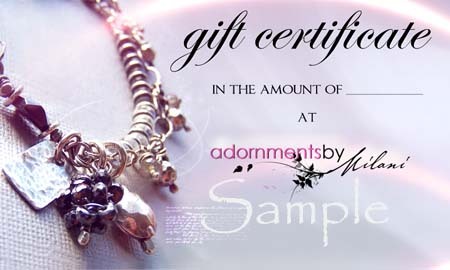 If you would like to give something that will truly be remembered but are unsure as to what to give, do choose a gift certificate. Don't forget all the special people in your life: mother, mother-in-law, grandmother, daughters, daughter-in-laws, dad, aunts, sisters, friends, co-workers, employees, teachers, etc.